The 1960s were a tumultuous time in American history, and the city of Cincinnati was not immune to the changes during this decade. Riots displayed the city’s difficult race relations, the Bengals brought professional football to the city, Riverfront Stadium was built and changed the layout of the riverfront, and the city of Cincinnati grappled with urban renewal. Each of these events is documented in the papers of Eugene Ruehlmann, which are housed in the Archives and Rare Books Library’s Urban Studies Collection. Ruehlmann, a 1948 graduate of the University of Cincinnati, served on Cincinnati’s City Council from 1959 through 1972, and was mayor of the city for four of those years from 1968 until 1972. Ruehlmann’s papers are invaluable to those interested in Cincinnati’s sports history and the history of the Cincinnati riverfront. He was closely involved in the negotiations that brought the Bengals to Cincinnati and his papers include notes from meetings, various correspondence, and reports. 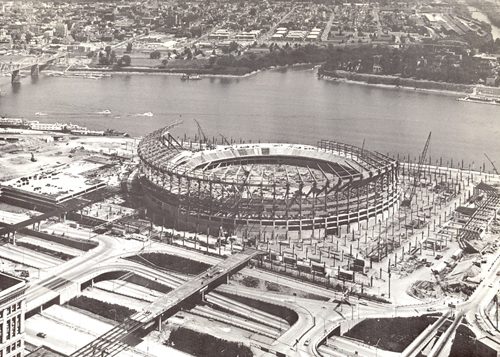 The reports and correspondence in the collection also chronicle the construction of Riverfront Stadium and the cost of its construction. 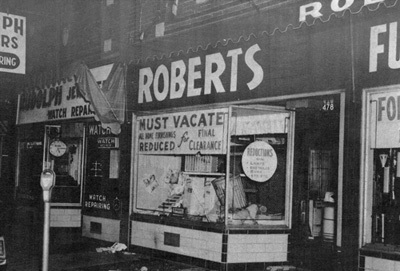 A police report on the 1967 riots shows a garbage can that was thrown into the window of Roberts Furniture Store on Burnet Avenue. Additionally, Ruehlmann’s papers document the history of race relations in Cincinnati. The collection includes reports and correspondence relating to the June 1967 and the April 1968 riots in Cincinnati and City Council’s subsequent investigations into the riots’ causes. Of particular interest is correspondence from many citizens that provides a glimpse into the impact of the riots on the lives of Cincinnatians, and the reports on the riots from the Cincinnati police and firefighters. The collection also allows a look into City Council’s concerns for Cincinnati’s impoverished citizens, found in correspondence and reports regarding Action Housing for Greater Cincinnati and HUD’s Model Cities Program. A complete finding aid for the Eugene Ruehlmann papers is available on the Archives and Rare Books Library website at: http://www.libraries.uc.edu/libraries/arb/archives/inventories/ruehlmann.pdf and in OhioLINK’s Finding Aid Repository at: http://rave.ohiolink.edu/archives/ead/OhCiUAR0022.